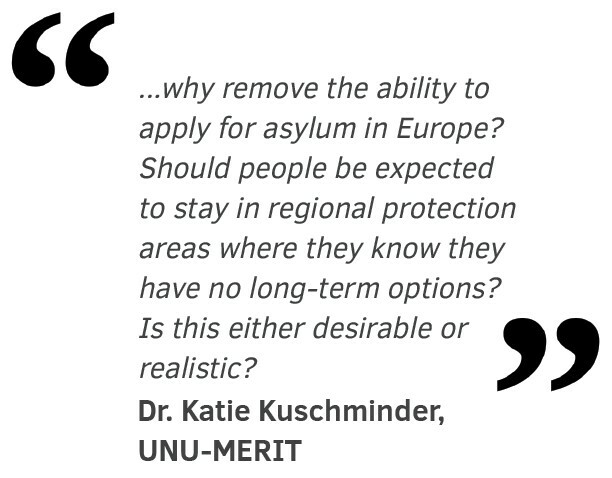 UNU-MERIT » Is This the End of Asylum in Europe? Is This the End of Asylum in Europe? 3) That some refugees accepted for asylum within their region can be resettled to the Netherlands and other EU countries. This approach questions fundamental values and hence the future of asylum in both the Netherlands and Europe. But that does not make it a forward-looking step. First, processing within the region by UNHCR has been in effect for decades. Refugees are hosted in camps administered by UNHCR wherein they have limited freedom of movement, because host countries such as Jordan, Kenya and Tanzania do not grant refugees residency rights within their territories. Long-standing problems exist in protracted refugee situations – defined as crises of five years or more with no end in sight – of no durable solution of local integration, return or resettlement for the majority of the world’s 10 million refugees in protracted situations, including Afghans, Palestinians and Somalis. As of 2016, the Syrian refugee crisis will become a protracted situation, meaning that the total number of protracted refugees will jump to at least 14 million. Second, ‘resettlement appetites’ are extremely small in the developed world, with less than 1% of refugees submitted for resettlement. In 2015, only 36,000 of the 2 million refugees in Turkey will be submitted for resettlement, with places reserved for the most vulnerable refugees. A Dutch researcher based at the Peace Research Institute of Oslo (PRIO), Cindy Horst, found during her research in the Dadaab refugee camp in Somalia that the dream of resettlement was so strong amongst the Somali population that the word buufis arose to refer to the dream of resettlement and the madness that would ensue when someone’s resettlement dreams were shattered. In extreme cases, individuals take their lives after failing to secure resettlement. In refugee camps, resettlement is the only hope and clearly the best option. Yet less than 1% of the world’s refugees receive resettlement. Refugees living long-term in camps have literally nowhere to go, nowhere to call home, and no one who wants them. Where can they belong? The newly proposed Dutch policy argues that with an absence of asylum seekers at the door of the Netherlands, more will be accepted for resettlement and the savings can be put into better reception facilities within the region. But what happens when refugees are not granted local integration? Must they forever remain in limbo, in ‘quasi-permanent’ regional receptions? And what about the local populations? Refugees in camps receive food rations, free healthcare and education — benefits to which locals do not have access. Over the long term, this kind of resentment can lead to further conflict. Third, the only country in the world th at has started offshore processing is Australia, which began in 2012. This means that refugees trying to come to Australia are taken to asylum processing centres in Nauru and Papua New Guinea. There has been much global outcry to this approach and questioning of the human rights and protection of the asylum seekers through this system, particularly after the death of two asylum seekers in Papua New Guinea. Fourth, this approach suggests that it will discourage migrants from using smugglers to access Europe, this putting their lives at risk. Yet I interviewed a Syrian woman with three children this May in Athens who told me that crossing to Greece from Turkey was worth the risk: “You only die once… when we saw how it was in Turkey: the life, the condition, the work, we decided to risk everything. We either live or die”. Smugglers are not the instigators of these problems, they represent the middleman. Clearly, the challenge of meeting the many needs of all those fleeing to Europe is vast and requires solidarity across Europe. The Dutch Government should be commended for offering further support to the UNHCR as it struggles to meet the needs of 4 million Syrian refugees in Lebanon, Jordan and Turkey. And unquestionably, refugees around the world have long-term regional protection needs and will need further support from countries such as the Netherlands. Yet why remove the ability to apply for asylum in Europe? Should people be expected to stay in regional protection areas where they know they have no long-term options? Is this either desirable or realistic? 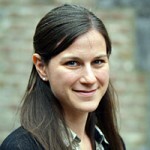 Katie Kuschminder is an Assistant Professor at UNU-MERIT and Maastricht University. This post is based on the results of her recently completed Rubicon Grant from the Netherlands Organisation for Scientific Research. The full results of her project on the experiences of Nigerians and Eritreans migrating to Italy will be published in the near future.